The first technology that allows for the simultaneous layering of multiple types of model materials. Polyjet printing uses a range of UV acrlyic based polymers to form high resolution layers down to 16 Microns. This extremely accurate technology leaves you with a part requiring minimal finishing. 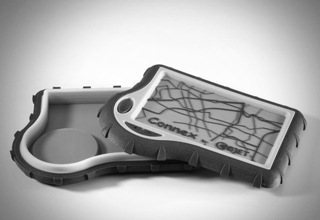 Arguably one of the best technologies for most rapid prototyping needs, the wide array of materials allows for flexible, interactive parts closest to the finished product. The materials are fully cured and office friendly, making it possible to have a 3D Printing station right on your desk. Two different photopolymer materials are used for building, one the support material, and the other the actual model resin. The geometry of the support material is preprogrammed by the CAD software, and allows for cavities, thin walled sections, and moveable parts. The product of the rapid prototyping system is then placed in a waterjet machine to remove any remaining support material, leaving you with your polished prototype. We use dual-jet technology to combine materials, which creates new composite materials tailored to your exact needs. Immediately after each layer is printed, it is cured by a UV light, which produces ready-to-use models that are very durable. Our technologies print a support material during the3D printing process which is easily rinsed off with water. Finally, because your prototype is built layer by layer, our technologies let you create moving parts that are ready to use right out of production! Digital Materials are based on a combination of different materials, which are composed on-the-go in a print. Using PolyJet Matrix Technology, this abundant new set of materials provides more added strength, increased Shore A values and greater flexural values than ever before. The mechanical and physical properties of 3D prints have never been so customizable or feasible. With the ability to hold construct and hold a working prototype, the opportunity for many new applications grows. You are much closer to your final product by practically testing your model and having it overmolded at an early stage in research and development. What other materials do we offer? When you have a completely accurate prototype, you are better able to reverse engineer any issues before you produce your final product. The ability to create a 3D ready to use prototype with specific properties opens many doors to new applications. This streamlined process creates an easier, super efficient product development cycle to both create top of the line prototypes, in a cost effective manner. Overmolding products and double injection process simulation – Completely remove design restrictions and manage part of the creation process with custom look, feel and functionality. Living hinges, gaskets and hoses – Manufacture parts that are durable enough to handle repeated bending and flexing, with terrific elongation at break combined with great resistance to tear. Biomedical and translucent parts – the combination of opaque FullCure Vero and FullCure720 materials allows you to create translucent medical models that can show nerved, bones, tumours and much more. Coating Parts – Coat rigid materials with flexible ones to manufacture a final product with unique touch and feel properties, flexibility, durability and more. Labelling, texture and imprints – Apply custom visual effects and transparency to separate different areas of interest while creating aesthetic appeal, without any post processing. Shock absorption and impact resistance – for vibration reduction, improved performance and protective covering. Durable end-use parts – Fulfill design requirements by manufacturing complex building structures in a single build process (print). Plugs and seals – create an airtight seal or watertight barricade on your model in one print. The Objet500 Connex3 3D Printer now allows for colours to be incorporated in your 3D Prints. Using a combination of Cyan, Magenta, Yellow and Black, a wide variety of colour can be added to your multi-material builds. Now parts can serve the same function as a standard Polyjet print, and have the added bonus of bright finished colours.